Popularly known as the shoulder blade, the scapula is a triangular shaped bone that sits on top of the posterior aspect of ribs 2-7. The scapula is a unique bone in that muscles are their only connection to other bones, whereas other bones are connected to each other via muscles as well as ligaments. This design allows for a great range of motion at the glenohumeral joint, providing us with an unparalleled freedom of movement of our arms. But we need to dive in a bit deeper so we understand scapular stabilizer function more completely. The glenohumeral joint is a ball and socket joint and the glenoid of the scapulae form the socket. But the glenoid, which is a part of the scapula, doesn’t just stay in one place, it must move to facilitate smooth movement of the joint depending on the position of the arm. An example is when the arms move overhead, the scapulae must upwardly rotate so the head of the humerus doesn’t impinge on structures like the rotator cuff tendons or bursae. This coordinated movement of the scapula and humerus is known as scapulohumeral rhythm. 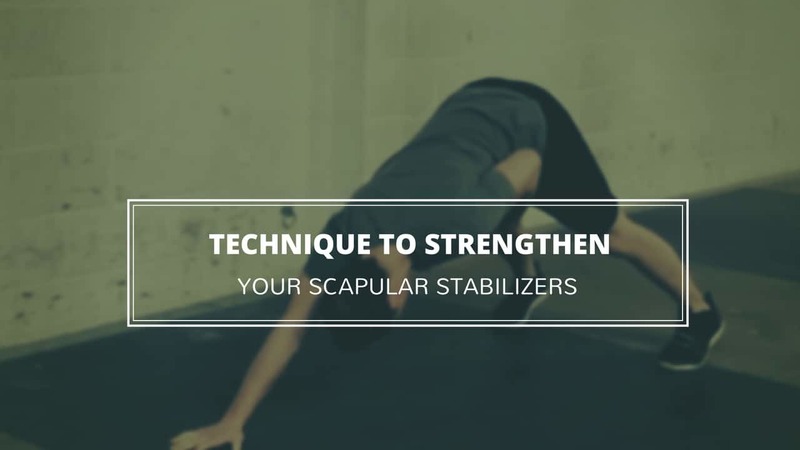 When this movement is dysfunctional, the scapular stabilizers aren’t working together properly. Different contributions of each of these muscles occur depending on the position of the arm, but all will be at least a little bit active during movements that involve the glenohumeral joint (upper arm). The drill we’re going to do today hits the second point. Before thinking about reps or sets, learn the nuances of the drill and ensure you’re hitting all of the technical cues. Then, being able to perform 1 full cycle with a 5 second hold in each position with proper technique is a great feat and you can go from there. This drill puts together many of the concepts you’ll learn in my Scap Control course, so if you have trouble with this drill or feel like you’re not capable of or you have pain/mobility issues that prevent correct execution, click here to learn more about Scap Control to build your shoulders up to the task.